Elena Kagan will be the fourth woman ever to sit on the U.S. Supreme Court. Washington (CNN) -- Elena Kagan was confirmed as the 112th justice to the Supreme Court Thursday and could be sworn into her judicial post by week's end. The vote on the Senate floor was 63-37. Five Republicans in the Senate had signaled their intention to vote for Kagan, meaning conservatives didn't have the strength in numbers to delay the proceedings with a filibuster. Only one Democrat announced his opposition: Sen. Ben Nelson of Nebraska. "I have heard concerns from Nebraskans regarding Ms. Kagan, and her lack of a judicial record makes it difficult for me to discount the concerns raised by Nebraskans, or to reach a level of comfort that these concerns are unfounded," he said in a statement. 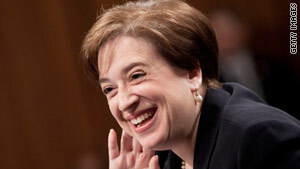 Kagan will become only the fourth woman ever to sit on the prestigious bench. The New York native and former Harvard Law School dean will replace the retiring Justice John Paul Stevens. She was picked by President Obama on May 10, and the Judiciary Committee sent her nomination to the floor last month.